Jerky Naturals, Real Beef & Rice flavor in 5oz. 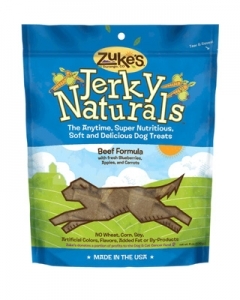 Pouches - Healthy Jerky Snacks for Dogs. It's time for a healthy alternative to traditional "junky dog jerkys". Jerky Naturals offer the nutritious benefits of real meat, rice, apples, carrots, barley, molasses, canola oil, garlic, brewers yeast, and flax seed. No wheat, corn, harsh preservatives like BHA, artificial colors or flavors, added tallow, by-products, or unhealthy fillers make them a naturally scrumptious treat.